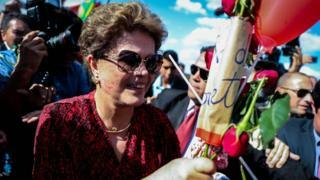 Former Brazilian president Dilma Rousseff has left her official residence in the capital Brasilia for the last time following her impeachment and removal from office. Supporters and colleagues gathered outside the Alvorada Palace to bid her farewell, some handing her flowers. Ms Rousseff was dismissed last week after the Senate found her guilty of manipulating the budget. She denies wrongdoing and has dismissed her impeachment as a "coup d'etat". Brazilian television showed Ms Rousseff walking out of the presidential residence surrounded by former ministers and Congressmen from her Workers' Party. How will history look back on impeachment? Supporter Cecilia Monteir, 56, said she was "very, very sad, feeling like the country will be left a bit orphaned". More supporters awaited Ms Rousseff as she arrived at an airport to board a plane to the southern city of Porto Alegre, her adopted hometown. On her arrival she was greeted by more well-wishers. Hours after the impeachment vote, Ms Rousseff's vice-president Michel Temer, was sworn in, ending 13 years in power for the left-wing Workers' Party. He will serve out Ms Rousseff's term until 1 January 2019. Ms Rousseff has filed an appeal at the Supreme Court against the Senate's decision but correspondents say it has very little chance of succeeding.